The CiT Raider is a Mid Tower professional gaming case with a 4mm tempered glass front panel and an acrylic left side panel. 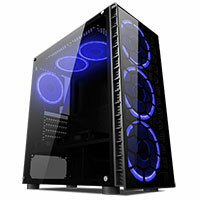 The Raider comes with a simple and easy to build design and a popular gaming internal structure. You can fit a total of eight fans but it comes with 4 x 120mm Single-Ring Halo Blue LED fans, three at the front and one at the back. Stylish Exterior - 4mm thick tempered glass front panel and a full acrylic left side panel not only gives the Raider a professional look but the added acrylic side panel makes the Raider much stronger and allows the user to show off their build. Fans - Supports up to eight fans with four Single-Ring Halo Blue LED fans included to give your case some added colour in your finished build. I\O Ports - Easy accessible 2 x USB2.0, 1 x USB 3.0 ports on the top with transfer speeds of 5Gbps means you can connect to a range of media devices.